This is an island of surprises. Who would have thought that quiet little Mayne Island could ever have been labelled “Little Hell,” for example? Blame the gold rush for that 150-year-old label. 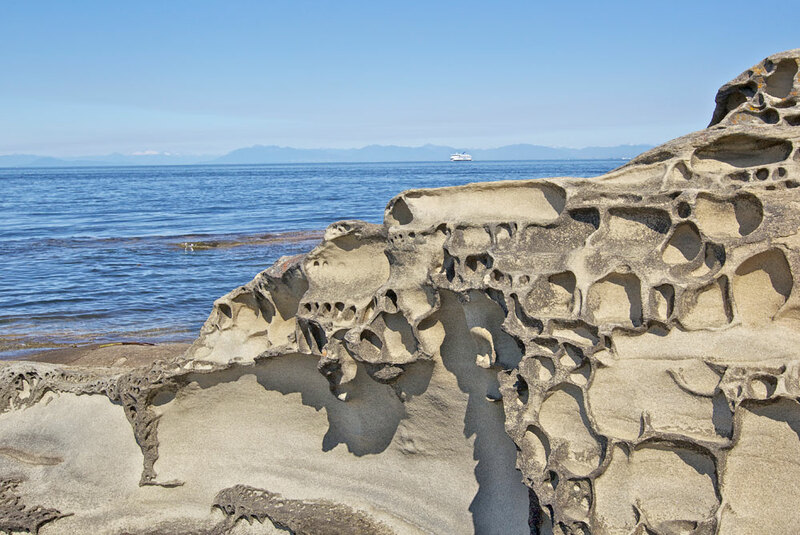 It was the miners who gave their name to Miners Bay, a jostling halfway stop between Vancouver Island and the Fraser River, en route to the Cariboo. Back then, Mayne was the commercial and social centre of the Gulf Islands, although other islanders looked askance at its reputation. Not surprising, then, that the Plumper Pass Lockup is an historic Miners Bay building. It’s now a museum. Another surprise is the roads. Even though it’s compact, Mayne has an excellent network, resulting in interesting circular routes and quiet roads — a cyclist’s delight. 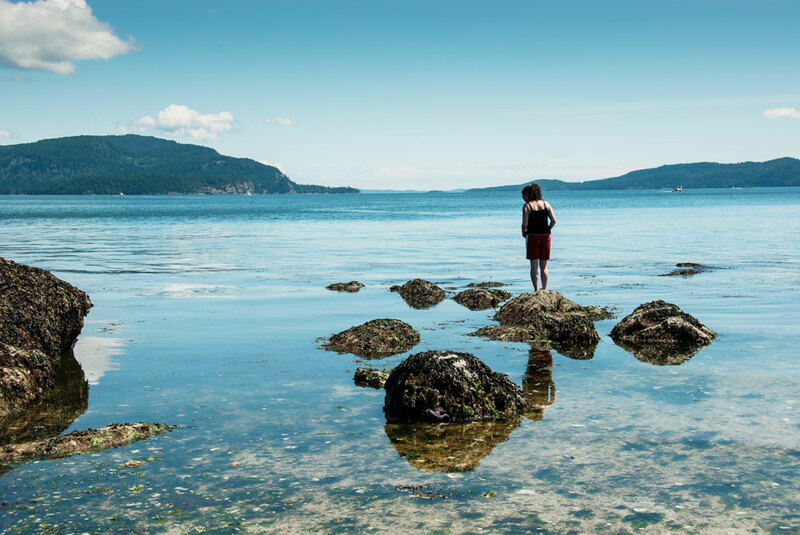 Swimmers will appreciate the warm waters of Campbell and Piggott bays, and hikers will enjoy the short but steep pull up to the viewpoint at Mount Parke at 255 metres (835 feet), the trail to Campbell Point, overlooking Georgeson Island, and the interpretive trail at Henderson Park. 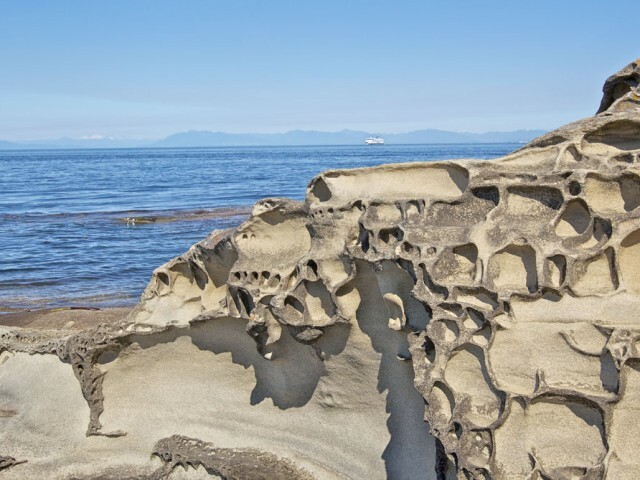 Everyone will enjoy the views at the historic Georgina Point Lighthouse, watching the marine traffic in Active Pass, and spotting killer whales and birds in this designated Important Bird Area. En route to the lighthouse is picturesque Mary Magdalene Church, which is worth a stop too. Built in 1898, its graveyard is home to many of the island’s pioneers. When it comes to places to stay, shop, play and eat, Mayne offers more surprises. 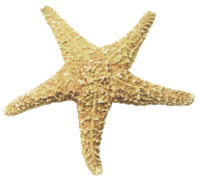 The island has a variety of accommodations, including resorts with cottages and villas, a privately operated campground, and many B&Bs that will make guests feel very much at home. Mayne Island has a lengthy farming history, from the settlers in the late 19th century to the Japanese who established themselves as proficient farmers in the early 20th century. At the peak of production they exported over 50,000 pounds of tomatoes each season. Today the farms on Mayne Island are productive again, with farmers having an outlet at various on-island stores, the local farmers’ market and roadside stands. Local food is stronger than ever on Mayne Island. 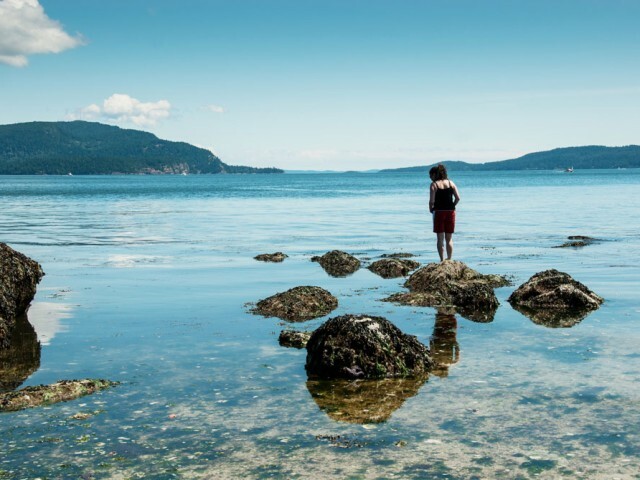 The original settlement of Miners Bay is still a thriving hub in which visitors can find many wonderful spots to watch the ferries go by in Active Pass, and visit what is said to be the oldest continuously operating hotel in B.C. 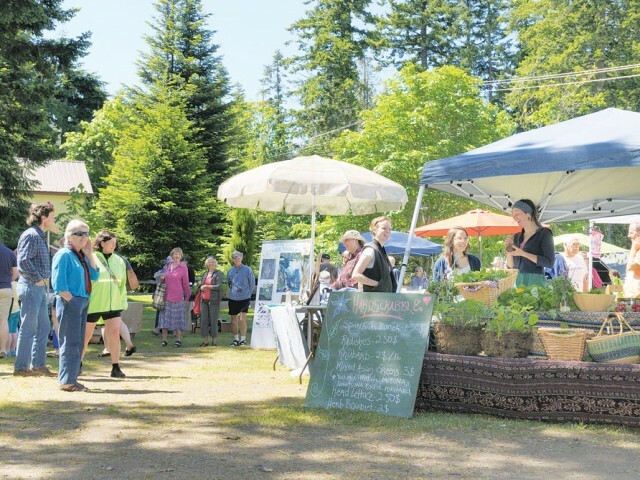 The old agricultural hall, site of the farmers’ market and fall fair, is also here, as is the library, grocery stores, restaurants and cafes, the Mayne Island Conservancy, post office, ATM, gas station and a variety of shops to fulfill home, body care and gift needs. Also worth a visit is the Fernhill Centre, another shopping destination with purveyors of food and clothing, as well as galleries. Artists’ galleries are also located throughout the island. These are a joy to visit and lead to the discovery of wonderful works of art while providing a chance to talk to the artists themselves. Head to Dinner Bay and the Japanese Gardens and once again you’ll be surprised. How can such a small island manage to create and maintain such beautiful Japanese gardens? Dinner Bay Park itself has a putting green and disc golf in addition to a children’s playground, picnic tables, beach access, benches, pavilion, water and toilets. It’s a surprisingly well-equipped park. If you wish to leave the land and explore the surrounding waters, Mayne is the ideal location for world-class kayaking, including kayak rentals, and other marine activities, such as eco-tours, fishing charters and inter-island sea taxis. Mayne has so many year-round activities that it’s best to check the events calendar online. Whoever would have thought that so much could be happening on a small island?